In week 2 and 3 of the Houston Young Professionals Executive Book Club, we continued our journey on the book “Think and Grow Rich” by Napoleon Hill. The book is an extraordinary look into not just the mindset of people who are successful but also a guide to help you begin to tackle the challenges set up in your own mind that limit you reaching the level of success you desire. The power of a book club is that it provides both the structure and the support to your commitment to read a book and as a result make some positive changes in your own live. Over the past two classes in going through the book with the group I am constantly surprised at how strong our minds are. I got a quick dose of the power that the mind has even before deciding to join the course. As the class begins at 7 am, my initial interested was quickly muted by of all the reasons I could not go to the meetings. My mind quickly filled with all the things I am currently juggling, questions on how to get my daughter to school, doubt that I could even successfully wake up and be people friendly that early. These self-doubts almost prevented me from signing up. The truth is, however, once you commit yourself to something you just have to have the persistence to endure the obstacles to get it done. With my mind made up to sign up to the book club, I got a lesson before even picking up the book on the power of your mind in controlling your life and how you can make the decision to take the power back. Over the past two classes we have tackled issues that it took the author 20 years to streamline and will take most of us a continual commitment through the rest of our lives to complete: determining our purpose and having the desire to commit to that purpose at all costs. Of course there is no book on the world with an easy answer to these questions as they are personal to each of us. The book does, however, provide the food for thought to help you drill down to what you want and how you need to get there. It can be easy to read the book, or any inspirational book, and still not see and put to action those components you read about in your own life. Within the structure of the Executive Book Club, however, you get another priceless gift as you share and grow within a group…accountability. Personally I sometimes keep my goals and desires internal at a volume barely over a whisper. When you have to share with others and support the through their feelings of doubt and discovery you learn to make those goals and desire more than just a whisper but a strong and confident affirmation. In discovering the power of the mind and of my own desires I am reminded that there is always room to grow and learn and always time to get back on track. 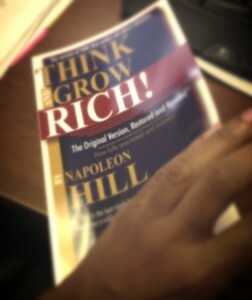 If you have not checked out the book it is a must read to assist you in streamlining your own path to success.